Transform waning fresh herbs into a citrus-spiked green sauce and use it to take everyday dishes up a notch. I store fresh herbs with the same care and attention I give to cut flowers and, as a result, can keep a bunch of parsley perky for a couple of weeks. Even so, there comes a day when I can see there’s not much time left and radical measures need to be taken. This is my regular solution: transforming them into a very lemony, very useful green sauce. Ordinarily, I make this salsa verde with parsley and coriander because they’re the two herbs I almost always have in the fridge. While I’ve suggested quantities below, it’s easier to think about proportions: use half as much coriander as the parsley and it’ll be fine. Sometimes basil makes it into the mix, taking it into pesto-ish territory, but I’ll focus on just one way to keep things clear. So, there’s the utility of extending the life of fresh herbs – and this will keep, perfectly well, in the fridge for at least a week. Then there’s the other great utility of this salsa verde: it works with so many dishes. It has become a go-to for taking even the most ordinary dinner to another level with absolutely no effort. Its uses do seem endless, so I’ll tell you three of the ways I use it, as guidance. 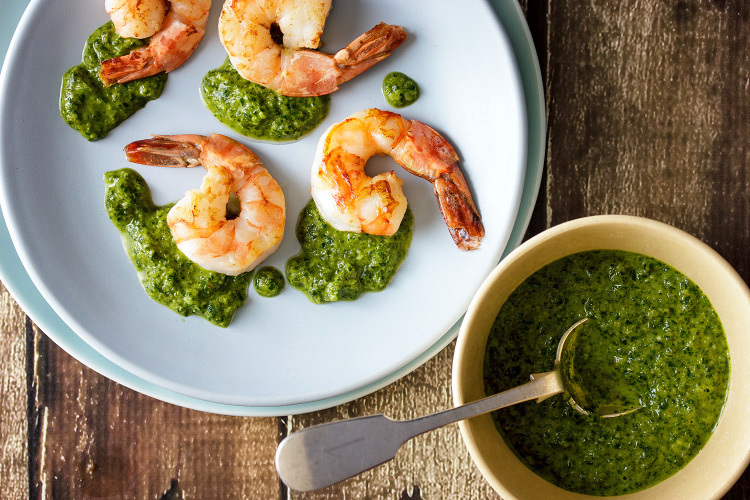 Take a handful of fresh prawns – or small pieces of fresh fish – and fry them in butter until golden, serving them on top of little dollops of the salsa verde. Beyond delicious. Steam tiny new potatoes, whole and unpeeled, and cut a deep cross into them to open them like a little flower. Spoon the salsa verde into each. Gorgeous as a simple side dish or even a party snack with drinks. Grill little lamb cutlets and serve on or under the salsa verde. It goes beautifully with barbecued anything. I use preserved lemon to add another, deeper dimension of lemon to this sauce. Pieces of preserved lemon are usually made from one-quarter of a lemon’s peel; I use half of a piece. Put the garlic, shallot, preserved lemon, salt and lemon juice in a small processor or blender. Pulse until everything is chopped and leave for 5 minutes – this will take the harsh edges off the shallot and garlic. Add the parsley and coriander to the processor and pulse until chopped and a thick paste forms. Now add the oil, just a tablespoon at a time, scraping down between pulses. You may not need the entire ¼ cup at all, depending on how much leafage you have used. Add only enough to make the mixture come together as a thick but just-pourable sauce. Store in a screw-top jar in the fridge until needed, letting it come back to room temperature before serving.